Mary is holding her son Jesus, who clings to her and is looking over his shoulder at one of two archangels who are holding the instruments of his passion and death. The archangels are Gabriel and Michael. (Their names appear in Greek.) Between the two of them they are holding the cross, the lance, the sponge and the nails. The Child Jesus knows with his divine Mind that the appearance of the angels is a prophecy of the suffering he will endure for our salvation. But he is also fully human, a little boy. He is frightened and he runs to His Mother for protection. She picks him up and holds him close to her. in Rome. For 300 years after arriving from Crete it was a beloved icon in the church of St. Matthew which was on that site. The tradition is that the daughter of the icon’s owner was told by Our Lady herself that that was precisely where she wanted her picture to be. 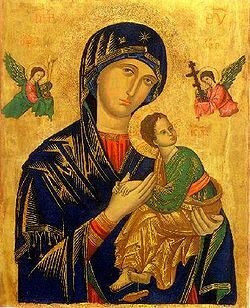 Once it was placed there, Our Mother of Perpetual Help became known and loved throughout Rome. Miracles big and small were associated with her picture, from the thousands who came to pray at the icon.